We investigate the influence of temperature on the retention curve of soils. This curve represents the constitutive relation between water content w and suction s, for a given temperature T and a given void ratio e. We present a model based on the differential of suction as a function of T, w and e. When adjusted for a retention curve obtained at a given temperature, this model enables to predict this curve for any temperature. In parallel, we carried out experiments on a clayey silty sand by using a pressure cell immersed in a thermostatic bath. 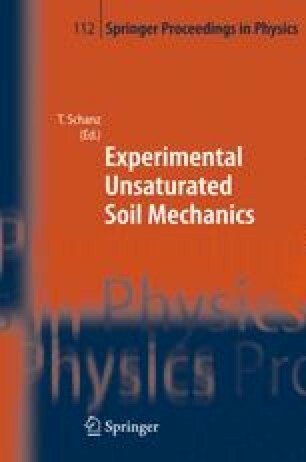 The model was validated by several tests on the clayey silty sand at 20 and 60˚ C. The application of the model to data found in the literature confirms its predictive power for a wide range of porous materials. These results allow us to plot the retention surface, from experimental tests obtained at a given temperature and from modelling. It can be considered as a generalization of the classical retention curve. Finally, we discuss the influence of the void ratio variation during experiments on the curve predicted by the model.